Another Friday, another pair of words: one new (to me), one with an unexpected etymology. Today's new word is Graygler (alternative: Greygler), which is a portmanteau of gray(-haired) and Googler. Definition: a Google employee who is "old," definition of old not clearly defined. ("Over 40" is one proposal I've seen, gah.) The term isn't particularly new; Forbes used it (in quotation marks) in 2012. 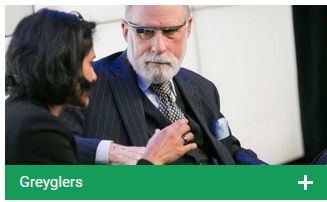 Google explicitly uses this term on its Diversity page, under a picture of someone who is, yup, gray-haired. I think that I first ran across this term in an article about how, um, old people shouldn't work so hard. It piqued my interest first because I am, of course, in that demographic. I also have an ongoing interest in what people who work someplace call themselves (an endonym? Maybe). I believe this is the first time I've found an example of a subgenre of employees. Try turning that thing on the side of the box. She and he have a thing going. What's unexpected here is that in the way-back history of English, a thing referred to a meeting, council, or assembly. This sense of thing in English is pretty much gone, but there are cognates in other Germanic languages: in German, a Ding is an assembly; in Swedish, the related term is ting.